The vegetable-celebrating newbie on the third floor of Vasant Kunj’s Ambience Mall, Purple Greene, hints at its motto with the two colours that make its name: luxury and ethical food choices. Its decidedly diverse menu, with a repertoire stretching from the Far East to — as Michael Moore would put it — Trumpland, fills the wide gap for mid-or-upper level vegetarian restaurants in Delhi. 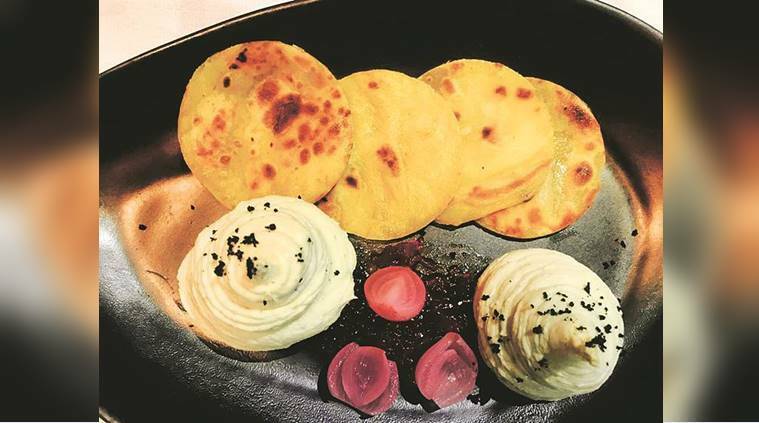 Its innovative spin on dishes, evidenced, quite literally, in the pinwheel-shaped samosas, seems more like a move to court ardent meat lovers, and court they do — at least with this one. The potato filling is rolled up in the pastry and then fried to a tantalising golden-brown. Served with a coriander chutney, the Samosa Pinwheels, despite the relatively demure filling, are reminiscent of the old street trouper. The drinks, too, are reinterpretations of classics, such as the Murgan Mary that replaces tomato juice with that of guava, and acquires another dimension from curry leaves added to the regular accoutrements of a teetotal Bloody Mary. It’s a full-bodied drink with a solid kick. Another seemingly unconventional starter, Indian Flour Taco Coins with Yam Pate and Naga Chilly Jam, however, bore a curiously stale stench. The DIY number comprised coin-sized rotis to be filled with the pate, which was really more like a mousse, while the Naga chilly jam could cause, the tribe of the fabled jolokia, deep shame. But the dish that comes closest to today’s vivid, straight-forward, clean vegetarian flavours is the African Spicy Vegetable Stew. A bowl meal of sweet potato, greens, peanuts and chickpeas served with buttered couscous makes for a filling and (relatively) guilt-free pick. The Scoop of Rock, a take on the popular makhane ki kheer, presents foxnuts, water chestnuts and Thai sago toffee with ice-cream and white chocolate. If cloyingly sweet, teeth-adhering desserts are not your thing, don’t lean toward this one. The eatery’s swish, contemporary vibe — and it doesn’t hurt that it’s a rather pretty restaurant — will probably ensure that it turns into an oasis for vegetarians. And though, it may seem like good judgement to put up a vegetarian restaurant in country that has long held — and is furthering — its reputation as a meat-loathing one, it might also help to inject nuance into their plates to ensure repeat visits.